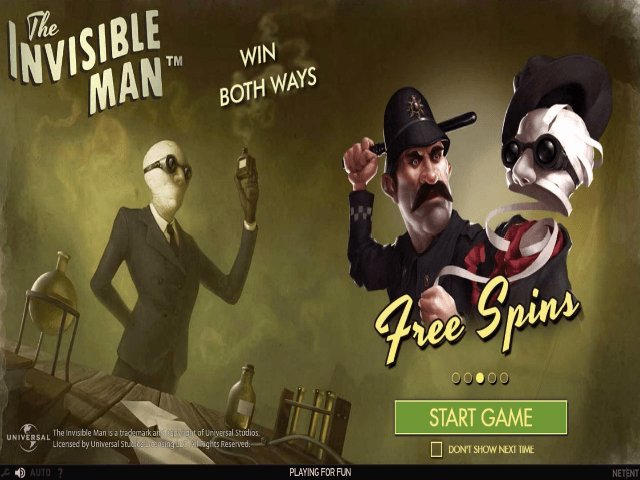 Taking its style cues from the 1933 movie of the same name, including creepy film score-style background music, The Invisible Man slot continues NetEnt’s epic Universal movies slot series. 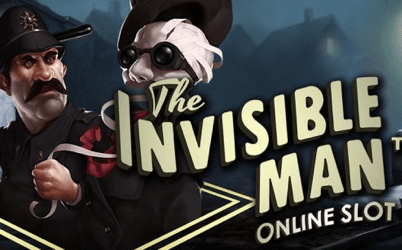 Play The Invisible Man For Free! Scientist Dr. Jack Griffin’s experiment finally worked – he is now the Invisible Man. But at what cost? Join the mad scientist as he evades the police in this tense video slot from NetEnt. Taking its style cues from the 1933 movie of the same name, including creepy film score-style background music, The Invisible Man slot continues NetEnt’s epic Universal movies slot series. This video slot has three rows, five reels, and a fantastic 20 paylines, allowing you to bet between 20p and £100 per spin. Coin denominations and betting levels can be adjusted based on your budget and preference. For your convenience, there’s also a handy Max Bet button and an Auto Play option. Like in most slot games, the aim is to land three or more matching symbols. The symbols are made up of standard A, J, Q, K and 10 symbols, but also include the distinctive film characters like the beer-guzzling Mr Hall, Arthur Kemp and Dr Cranley. Griffin’s sophisticated fiancée Flora Cranley is the highest ranking symbol – matching five of her will win you an impressive 500 coins. The game includes two separate wild symbols – Police Wild and Griffin Wild. Both wilds walk across the reels, meaning they are often in play for more than one spin, and substitute for all other symbols. Landing one of the wilds on the reel also activates a re-spin, giving you more chances to win incredible prizes. If the Police and Griffin Wilds merge together on the reels during the main game, ten free spins will be activated, and if the two wilds merge during a free spin, you’ll get four more free spins. Fortunately, these aren’t the only features that are offered. Bonus games are activated during the free spins, and begin if eight wilds appear to fill one of the meters above the reels. During the Police Spins round the detective promises: “I’ll lay traps that even an invisible man can’t pass!” He shoots at the reels to turn five symbols into burning wilds, while you play an additional three free spins. Collecting eight Griffin Wilds during the free spins activates the Griffin’s Rage bonus game. The mad scientist announces “Let the terror begin!” before allowing you to visit three locations and watch him cause havoc. Throughout your journey, you will have to click to reveal prizes. The prizes will add to your running coin total for the bonus game. Another great feature of this slot is that you can win both ways. This simply means that winning paylines can be activated from right to left, as well as the standard left to right. This effectively doubles the paylines and increases the chances of a win. Like any good horror film, this game will keep you gripped as the tension rises.